Late last year I picked up the Reeve Hunter and his three pet War Wolf missiles. Today I finally finished painting them. I take forever to paint a model these days — even more so than in the past — due to a busy career and a number of impromptu lunchtime meetings cutting into my painting time. Let's play fetch. The hard way. Painting the Reeve Hunter was surprisingly challenging, but also very fun. I wish I had chosen brighter green for his armor, and the sword really dulled down with the matte varnish in a way I wasn’t expecting. In general, however, I am pleased. 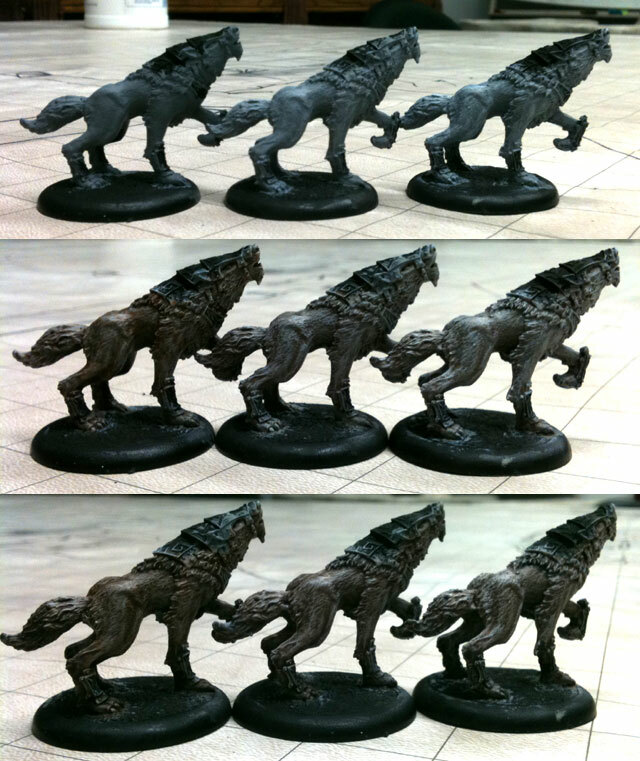 For the War Wolf Solos, I applied a basecoat of medium gray over black primer, drybrushed with light gray and white, then washed in sepia. I drybrushed up to white again, washed down in sepia, and finally drybrushed up one last time. I wasn’t sold on the result until I painted the armor and harnesses — the fur looks much better in contrast with the other colors. Real wolves are not as fond of brushing as tiny metal ones. As always, I tend not to paint the models I am playing — so the Lord of the Feast will never be painted, I guess — and I haven’t figured out the best use for this five points of roving death. Of course I have the proper licenses. Come check their collars. 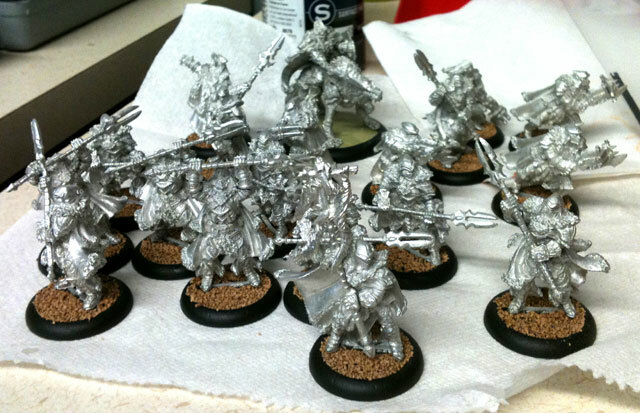 My collection of Circle Orboros is continuing to grow, unfortunately it is growing into a pile of unassembled models, much of it infantry. I remain woefully inept at pinning and I had been avoiding the frustration to be had pinning lots of little hands to spears. I despaired of ever being able to run Morvahna or Mohsar, however, who depend on infantry spam. So I finally bit the bullet and assembled — without pinning — a full unit of Wolves of Orboros with Unit Attachment and a min unit of Reeves of Orboros. I did pin Wolf Lord Morraig with predictably inaccurate results. I don't think the fur is faux. Painting all these are going to be a chore, I’m going to wait and see how bad the joins are — those spears are bound to catch on everything. I am halfway inclined to just go Indonesian, next time.